Ever since I was a teenager I have been fascinated by tribal cultures. I devoured National Geographics, took Anthropology elective classes at Uni and have always sought out remote places on our travels. 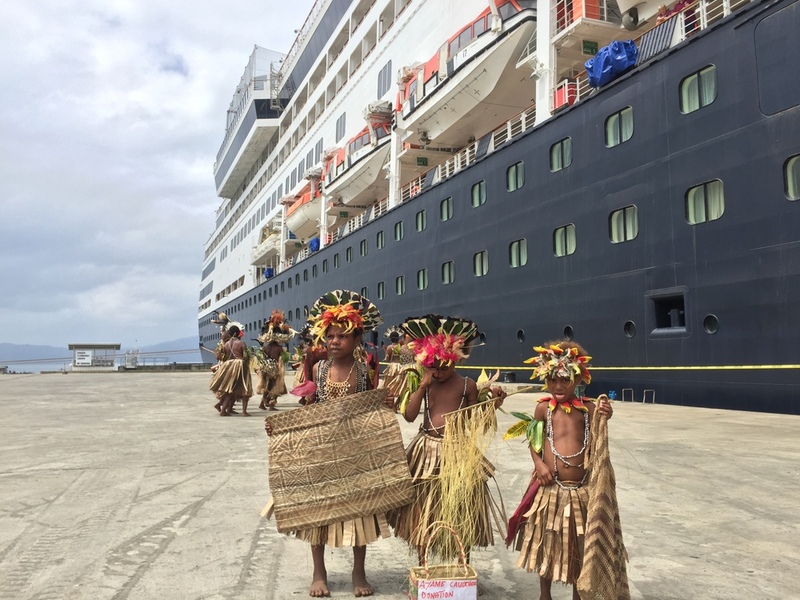 When I noticed that P&O Cruises Australia visited Papua New Guinea (PNG) I was hooked. Our kids had been wanting to do a cruise for ages and PNG completely captured us as a destination. Many Australians are very familiar with PNG from its WW II history and the Kokodo Track is a popular pilgrimage for Australians. 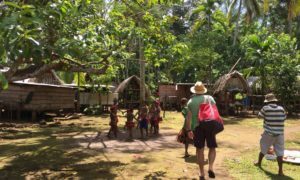 But, my knowledge of PNG was more focused on cultural and anthropology and I was eager to learn more about this remote country. We travelled on the P&O Pacific Eden from Cairns on a 7 night cruise that visited 4 ports in PNG. I knew visiting these remote parts of PNG was going to be an incredible opportunity, but I had no idea how much we would enjoy our first cruise together as a family. Shore days left me with goosebumps as I reflected on the interactions we had with the locals and their willingness to share their culture and way of life with us. We visited the ports of Alotau, Kitava, Kiriwina and the Conflict Islands in PNG. Alotau is the regional capital of Milne Bay province and an important World War II site and supply station for outlying villages. Kitava and Kiriwina in the Trobriand Islands are remote islands where villagers have been living an untouched tribal way of life for centuries. Our last port, the Conflict Islands is an uninhabited pristine island known for its beautiful beaches and incredibly biodiverse coral reefs. Each of them were amazing ports to visit and allowed us to experience the culture, people and breathtaking islands of Australia’s nearest neighbor. The islands of Kitava and Kiriwina were studied in the 1920s for their unique matrilineal society. You might have even read parts of Bronislaw Malinowski’s book “The Sexual Life of Savages in North-Western Melanesia” based on these islands. Their tribal culture has not been exposed to modern influence and it is only in the last few years that cruise ships have visited with less than 20 ships scheduled to visit each year. As you step foot on each island you will realize that the ship coming in is a major event on the islands where it seems most of the island residents have come to the beach. They line the coral pathway with carvings and baskets laid out on woven mats, hundreds and hundreds of them. Some having done 3-hour walks, leaving in the dark to be setup prior to the boat’s arrival. The first thing you will hear is the school children in their traditional tribal attire sweetly singing for the visitors. Many do speak English and since there are no ship excursions on these islands, you can ask an unofficial “guide” to show you around the village. We have traveled through many developing and third world countries, but as you can imagine, these PNG islanders live a very subsistence life with no electricity, running water, cell phones or regular outside contact. Their homes are tiny thatch one-room structures, the schools rudimentary and they have very little possessions. Yet, many claim that their diet is the healthiest in the world based on a diet of tubers, fruit, coconuts and fish. We found the locals to be shy and timid at first, many not confident in their English and in speaking with foreigners. But a smile was always rewarded by a big smile in return. What was so refreshing is how the locals do not expect anything from you. Our kids were often gifted with flower head bands with no expectation of reciprocation. One of the things you will notice right away is the red toothed smiles. Betel nut is at the centre of life in PNG and even women and children compulsively chew and spit the red liquid. The islanders use homemade dugout canoes with a single outrigger to get around their island and visit nearby islands. Our kids immediately termed these boats “Moana boats” and they are definitely worth experiencing on a visit. On Kitava after touring around the village and school, we took a traditional sailing canoe 300 meters across to Nuratu Island. It was definitely a thrill to sail across the channel with our sail made out of sewn together tarps. On Kirawina, it is common for younger boys to take visitors out for a paddle canoe ride alongside the beach. Both are great opportunities to interact with the villagers and infuse some cash into their economies. PNG is renowned for its incredible biodiversity both above and below the water. With much of the population living a sustainable, subsistence life, the marine life is extremely healthy. The islands cover 1% of the world’s land mass, but contain 5% of its animal and plant species, 2/3 of which are only found in PNG. We brought our own snorkel gear and found the coral and marine life to be some of the best we have experienced. Even the colour of the water, which we nicknamed “jelly blue” for its deep, rich colour was something I had never seen before. The reefs were healthy and vibrant with so many different types of coral. At the Conflict Islands snorkeling was like swimming through an aquarium with so many different types of spectacular fish. We spent hours in the water taking it all in until the backs of our legs were sunburned. Even if you don’t want to get wet, you can still experience this underwater wonderland. At the Conflict Islands they offered glass bottom boat tours and you can rent cool, see-thru kayaks. Just paddle over the reef, look down and you feel like you are underwater! The people of this region are renowned for their skillful wood carvings and this was another one of our highlights of our Papua New Guinea cruise. Even without modern woodworking tools, they manage to create beautiful carvings. Hundreds and hundreds of people bring their wares to the beach in hopes of making a sale or two. You want to buy something from each of them as they quietly and politely hold up what they have to offer. The prices are ridiculously low and yet this cash will allow them to improve their lives. Common products are bowls with shell inlays, walking sticks, animal statues, traditional boats, shields and necklaces. In addition to wood carvings, the women weave intricate mats, purses and baskets. Beautiful, exotic shells were also being sold, although for environmental reasons, you may want to abstain from buying them. We had no trouble bringing our many carvings back to Australia, which will make amazing mementos from our trip. If visiting, make sure you bring the local currency (Kina) as the locals do not have an easy way to exchange money. Many might worry that visiting such untouched islands is detrimental to the culture and traditional way of life of the locals. What I saw was small-scale and sustainable tourism. The locals I spoke with feel strongly that the ships visiting are important for their islands. By employing a local guide, purchasing the beautiful handicrafts, and paying for a trip in a traditional boat you are bringing much needed cash to the villages. You are also learning about their culture and way of life. It did not feel exploitative at all; on the contrary it felt very authentic. With less then 20 ships scheduled to visit each year (only half of which are actually able to tender to the island) there is a good balance between bringing tourism to the islands while not disrupting the local way of life. It appears that P&O’s lack of shore excursions helps prevent the development of middlemen or larger organized tours that might reduce what ends up in people’s pockets. We felt good knowing that the cash we were spending was going directly to individuals or school groups. The people on these islands do not have a lot and are very appreciative of the donations the cruise passengers bring. We had purchased school supplies and some balls to give away and this was a wonderful opportunity for our kids to be involved in giving. They saw the conditions of the schools, they saw the clothes the islanders were wearing and they saw their homes. It was magic to see a child’s eyes light up when they were handed something as simple as a pencil or bouncy ball. Our kids quickly realized how good it feels to give and saw first hand how needed they were. Even once we had handed out everything we had brought, our kids loved exchanging high fives, with both children from each culture thrilled at the exchange. I only wish we had brought more to share. I ended up giving away my youngest child’s thongs and shorts to a boy who was so ecstatic to receive them. We watched as he went around showing off his new shoes to his friends and it definitely filled our hearts. We know these are little tiny acts that don’t make us special, but hopefully they make a difference for someone and help teach our children the importance of giving. Although we try to shun a materialistic life, we still have way more then we need. Being in these villages in a great reminder to both us and our children that things do not make us happy. The P&O ships have a fantastic kids club that our kids loved participating in. They couldn’t wait each day to get back to the ship and resume the scavenger hunts, mini Olympics or dance parties. It was great to give the kids so much independence on the ship to meet their new friends and grab their own snacks. Since the kids loved kids club so much, it gave us an opportunity to have dinner dates and spend time together. I love spending time with my kids on vacation, but it was nice to have both family time and couple time. The kids club even organized and produced a kids theatre show on the last day where the kids sang, danced and showed all their special talents. They met new friends on the cruise that I know they will keep in touch with. Our kids love adventure activities and we knew they would love P&O’s Edge activities where you can zip line down the top deck, walk the plank, climb the funnel and do a high ropes course at sea, among others activities. Each day they would participate in one or more of these thrilling activities. Alone each of them are really cool experiences, but add in the fact that you are doing them while sailing with exotic islands as a backdrop and you have a really amazing experience. Visiting PNG was a surreal experience for me and something I never thought would be possible. The degree that we were welcomed, the glimpse into this rich tribal culture and opportunity to learn about their customs and traditions was a dream for me. This cruise was a wonderful blend of visiting this incredible destination and enjoying a family-friendly holiday. We loved being pampered with delicious foods, amazing entertainment and luxury at sea. This wonderful taste of PNG has left me yearning for more and we are already dreaming and planning about our next cruise. I will have more posts coming shortly about the individual ports we visited and our experience cruising with P&O as a family. Do you have any questions about our cruise that I can answer in upcoming posts? Put them in the comments below and I will make sure I address them in future posts. Such a rare destination! I would love to see more of your trip! It really was such an interesting place to visit. Will definitely be posting more on the trip soon! Wow. So jealous! I’ve also taken some cultural anthropology classes in uni cuz i’m also interested in tribal cultures. I wanna go there so badly! I must be extremely interesting to go there in real life. Great post! It was a really surreal experience and definitely left me wanting to spend more time there and learn more about their way of life? Looks like an amazing experience. So glad you were able to give back while there! Would have loved to have done more but it did feel good for the kids to see how good it feels to give. Wow! This looks like a worthwhile trip. Nice that your family got to enjoy it together. Loved that you were able to give some items to the children whilst learning about a new culture. Would love to go on more trips like this. Thanks Karen! I definitely feel so lucky to have visited that remote region of PNG. It was a short taste but I would love to return for longer? I was so excited when I stumbled upon the cruise there because I never thought I would get to visit. It really was an awesome way to reach some very untouched areas. I live in PNG for four years – Port Moresby – and had the most amazing experience. We always wanted to visit the Conflict Islands but it’s super expensive to stay there. What a great way to show your kids a different way of life. It was such a special trip Rebecca! Conflict Islands were absolutely amazing so hope you get there one day. The cruises from australia are very reasonably priced? 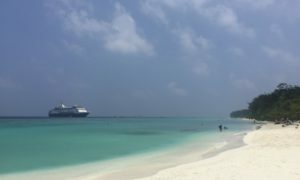 Heading to PNG on the same cruise next month, thank you for your post, it gave me some great ideas and a heads up on what to do and what to take. I have been collecting school books, coloured pencils and felt pens for the trip. I just can’t wait! We are doing the cruise in October. I was wondering what the best kind of gifts to take for the locals. Would children’s T shirts be appreciated? I think school supplies are what they appreciate the most, but clothes would be great as well. It is such a wonderful opportunity to visit these islands – have a wonderful cruise!